Soon visitors will be able to access in-depth historical information via a new Pittock app. Pittock Mansion has secured $29,000 in grant funding for Pittock Connect, the next phase of our Visitor Experience Plan that will use technology to facilitate deeper exploration of Portland’s history. Pittock Connect will expand the educational value of the Pittock while maintaining the fun that makes Pittock Mansion Museum appealing to those who are unlikely to be reached by other cultural and educational institutions. Our Visitor Experience Plan, drafted in 2012 based on research and surveys, helps ensure we make decisions with visitors’ needs and wants in mind. With the help of $83,000 in grant support we have completed Visitor Experience Plan phases 1 and 2, which improved directional signage and added narrative and interactive enhancements to the permanent exhibit. 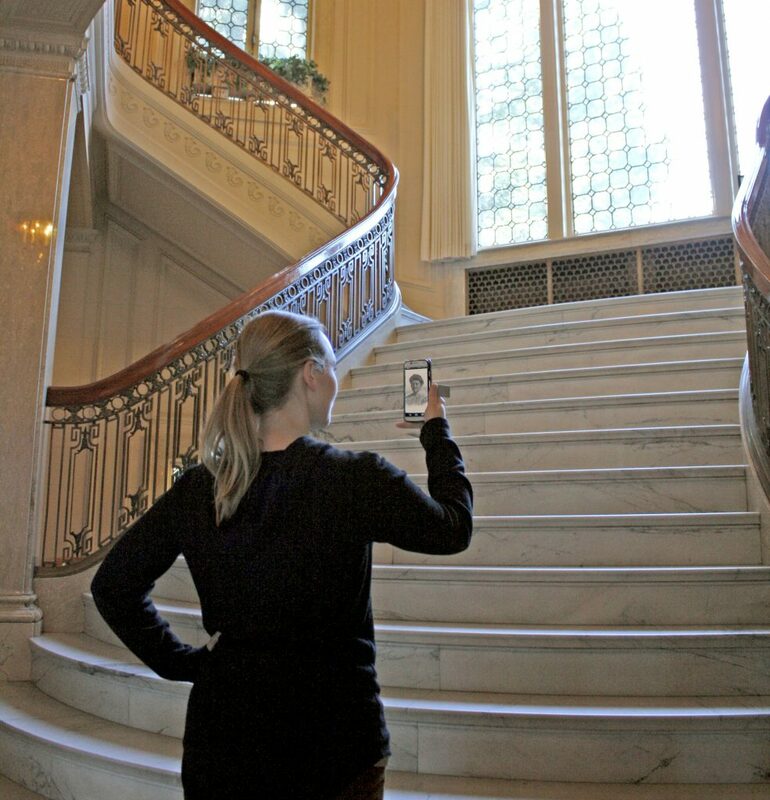 The third phase of the Visitor Experience Plan, the Pittock Connect project, will connect visitors to expanded information about Pittock Mansion and related Portland history through their information devices – smart phones, tablets, and more. To launch Pittock Connect we will make our website more user-friendly by improving its design and creating platforms for users to interact with us. Next, we will connect visitors with dynamic content from Pittock Mansion Society’s extensive archives with an app. After being invited to access the app in the ticket area, surrounding park, or through online searches for Pittock Mansion, users will be able to dig deeper into topics that pique their interest as they learn about Pittock Mansion and Portland history through photographs, illustrations, quotes, biographical material, and more. The app will highlight multiple perspectives, including those of the women and minorities who played a large part in the daily life of early 20th century Portland. The Pittock development team successfully secured funding support for Pittock Connect from The Jackson Foundation and an anonymous family foundation. These foundations provided sufficient funding to begin and we will continue to work to secure the remaining funds needed. We are excited to enrich the Pittock Mansion experience and create a valuable, modern resource for all who want to learn about regional history.